Board game publishing is a fascinating beast, and–like traditional publishing–it can be a hard area to break into. 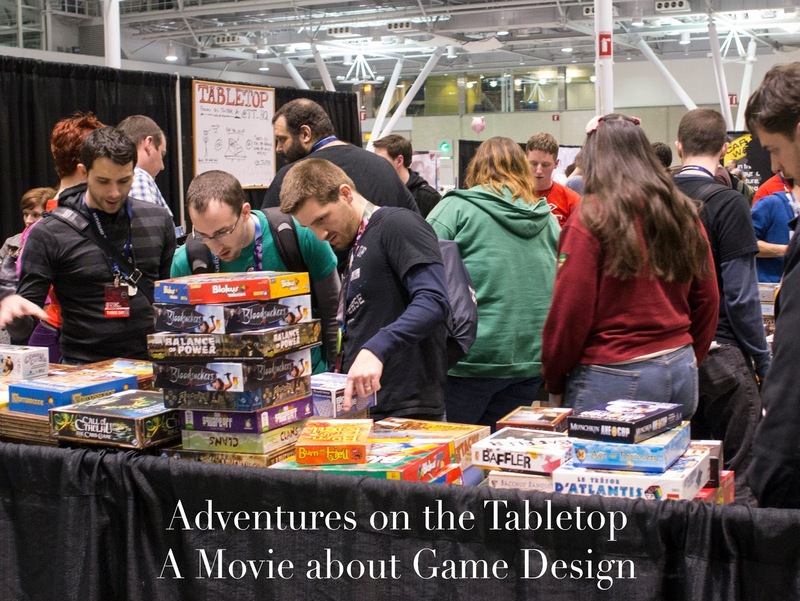 An interesting project currently on Kickstarter is Adventures on the Tabletop, a documentary that details the board game design process, from prototyping and pitching, through development and the publishing process, and into the finished product. 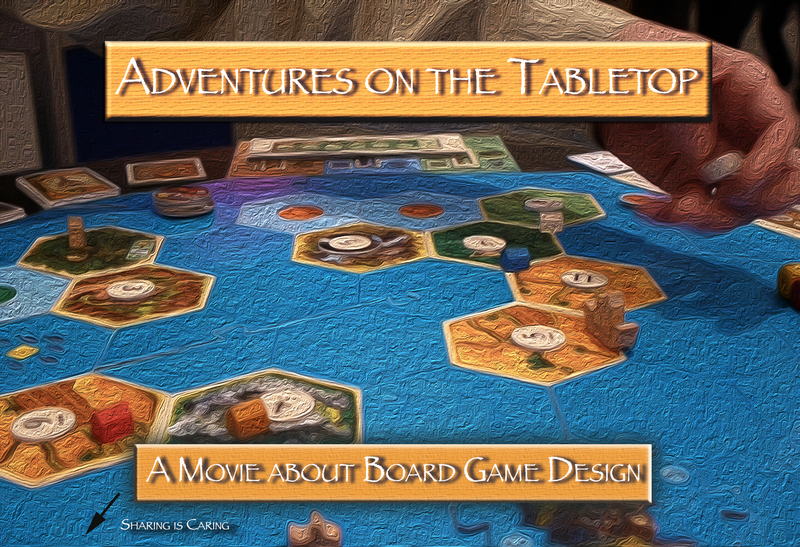 We spoke with Doug Morse, the filmmaker behind Adventures on the Tabletop, to discover more about his project. Tell us a little bit about yourself. How did you become involved with film? Why are you interested in particularly documentary filmmaking? I’ve always loved writing and photography. When I saw Fellini’s Amarcord in college, I thought ‘I want to do that’ because it brought together many of my passions: storytelling, photography, and writing. I didn’t realize that filmmaking would eventually entail working with actors, and that has been the biggest challenge. What I discovered was that working with actors on a shared story really harkens back to my D&D days. I also have discovered that my Tabletop obsession is another way of telling a communal narrative through conflict. I’m not interested in documentary per se, but in making movies about subjects I’m passionate about, whether fiction or documentary. What is Adventures on the Tabletop about? Who will want to get involved with your project? This is an awesome movie about tabletop game designers! We delve into game development from inspiration, prototype, playtest, development, and publishing. The designers we’re following, including Alan Moon, are fascinating, creative people, in fact much like directors and writers. The movie is for new game designers and gamers who want a peek ‘under the hood.’ Gamers will gain great insight into our hobby, and I hope new designers will learn about successful strategies for both design and publishing. You’ve got an impressive cast of designers lined up. How did you go about arranging the content for your film? How has the design community responded to your efforts? I knew I needed some known designers to anchor the piece, and so I e-mailed Alan to ask him for an interview. That’s when he invited me to The Gathering (I hadn’t attended since they moved from Springfield to Columbus). I also contacted Mike Fitzgerald because he and I had overlapped in gaming groups and I had playtested one of the Mystery Rummy series games for him. Designers, both established and new, are very open and do love to talk about the process. Since I am filming a lot of prototypes, I just assure the designers that 1) the movie won’t be released for at least 18 months and 2) I will check with them first. Documentary filmmaking is about trust, and I think the designers and gamers I’ve talked to quickly know that I love the hobby and want to dig deep into the design process. I think it’s fun for people to talk about and share their work. At the same time, I am trying to push the documentary nature of the movie to record events as they happen, whether it’s a pitch session with a major publisher, a designer going over manufacturing tolerances with his publisher, or a spirited debate about fulfillment, distribution, and shipping costs. These are all very real scenes I’ve captured that will dynamically allow the story to unfold. For those scenes, you’ll have to wait for the movie. Your plan for capturing the board game design process on film sounds pretty comprehensive. Can you talk a little bit about the Kickstarter access to some of your extended footage? What is the value here for backers? Movies, especially documentaries, can take a long time to complete. The filmmaker is continuously gathering raw material and shaping it into a story. Creating an engaging feature-length narrative is the toughest challenge and the most important task of the director. It is really easy to screw up the story. Many backers of the project want the movie yesterday. They wish they could order it on Netflix tonight. But the movie doesn’t exist, and I only have the beginnings of raw material. While preparing the Kickstarter campaign, I hit upon a solution. There is a mass of material that will not fit on the narrative spine that will be of special interest to beginning designers and gaming enthusiasts. I realized that I could release extended material for backers a few months after the campaign ended. The material would only need light editing. The footage would be a great reward and truly in the spirit of Kickstarter exclusives for backers. Stretch goals trigger the availability of material. By the time you post this, we will certainly have made our first stretch goal, and this special feature will be released in September. I set up a great interview with designers Alan Moon and Chris Handy. Perhaps only a few minutes can make it into the movie, and our backers will really appreciate a more comprehensive insight into Alan’s design process and discussion of his career as a designer from Avalon Hill to Parker Brothers to his own company, White Wind, and of course the stunning success of the Ticket to Ride series. We talk about how it has changed him as a designer. At The Gathering, I set up an hour-long panel discussion between publishers from Hans im Gluck, AbacusSpiele, ThinkFun, and eggertspiele. If you want to pitch something to a major publisher, this really is pure gold. Again, I don’t know how much of this will make it into the main movie. A filmmaker is ruthless in the editing room, and in fact releasing this material will allow me to keep focus on the developing story and not feel guilty for leaving something interesting out. If we make a larger, as yet undetermined stretch goal, I will be able to travel to Essen, and I will not only post updates, I will be able to post footage from the fair as well. The more successful the Kickstarter campaign, the more value I can add for the people who support us now and the more comprehensive I can make the documentary. How did you find your way into tabletop gaming? What are your favorite games, and what do you like about them? My gateway game, like many, was Settlers of Catan. Actually, Die Siedler Von Catan, because at the time I got into the hobby, there were hardly any English-language versions of the games. I put a lot of hours into playing, and I like to think I was at one point one of the best. Those days, though, are far behind me. It’s a real rush, the competition and the strategy playing with friends and strangers (who often become friends). Great games are not about luck, no matter the number of times the dice are rolled. They are all about probability. I learned that from Monopoly, and in fact the dice, building, odds, and trading of Settlers all harken back to Monopoly–which undeservedly gets a bad rap. You mentioned in your Kickstarter video that you got the idea for the “story” aspect of Adventures on the Tabletop from “Caine’s Arcade.” How did “Caine’s Arcade” inspire you? When I was watching “Caine’s Arcade” for the first time, I thought I was just watching a little homemade video. About halfway through, I was struck by the mastery of craft that was going into the filmmaking. So before I finished watching, I looked up the filmmaker. The director, Nirvan, was someone I had met at the Sarasota International Film Festival over ten years before, and we had hung out one crazy night. It’s funny how our paths take us in different directions. For a long time, I knew I wanted to make a movie about our subculture, but I didn’t want to make something just about the gamers. Frankly, I didn’t see a good story in it. When I saw Caine and the arcade he made out of cardboard, I was inspired. Caine is a game designer drawing his inspiration from arcades just like Teuber and other game designers draw inspiration from designers before them. And Caine was fascinating. I knew a few designers and figured others would be willing to share their stories. I had finished my adaptation of Christopher Marlowe’s The Jew of Malta (sword fights, poisonings, Renaissance costume, and wonderful language) and started my new Adventures. 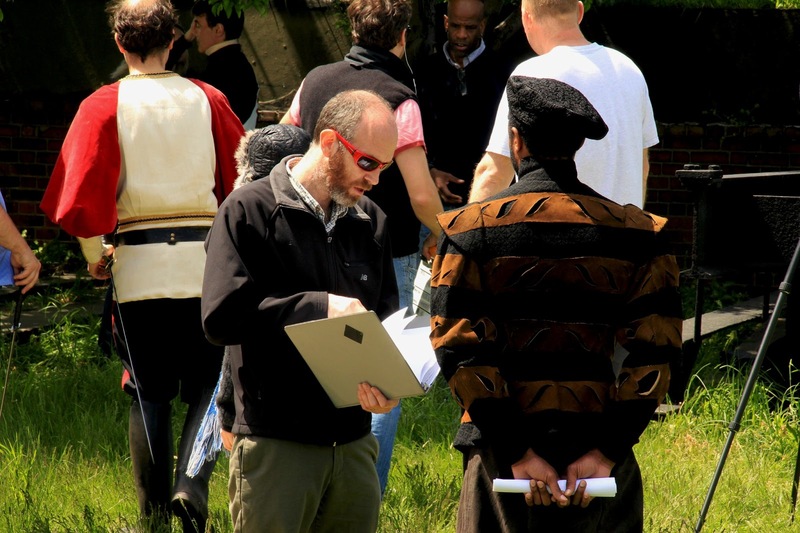 Doug Morse on the set of The Jew of Malta. You’ve already passed the funding goal on your project (congratulations, by the way!). What will additional funds collected go toward? My modest funding goal was to keep me shooting through the end of the year–though the extent of my travels would be limited. In the second video on the Kickstarter page, Chris Handy and Alan Moon trace my proposed route to continue to work on the documentary. Stops include major conventions like Origins, GenCon, BGG.CON in the US, and four major publishers in Germany and of course the Essen Game Fair. Each one will cost upwards of a thousand dollars once you factor in airfare, fees, and lodging. The bottom line is the more funds raised, the more comprehensive the documentary. At my dollar reward level, backers have access to hours worth of extended interviews, panel discussions, and more. So if for some reason a backer is only comfortable with the dollar reward, they will get the most bang for their buck! You’ve begun work on the film already. What has been the highlight of your process so far? Has anything surprised you in the making of this documentary? 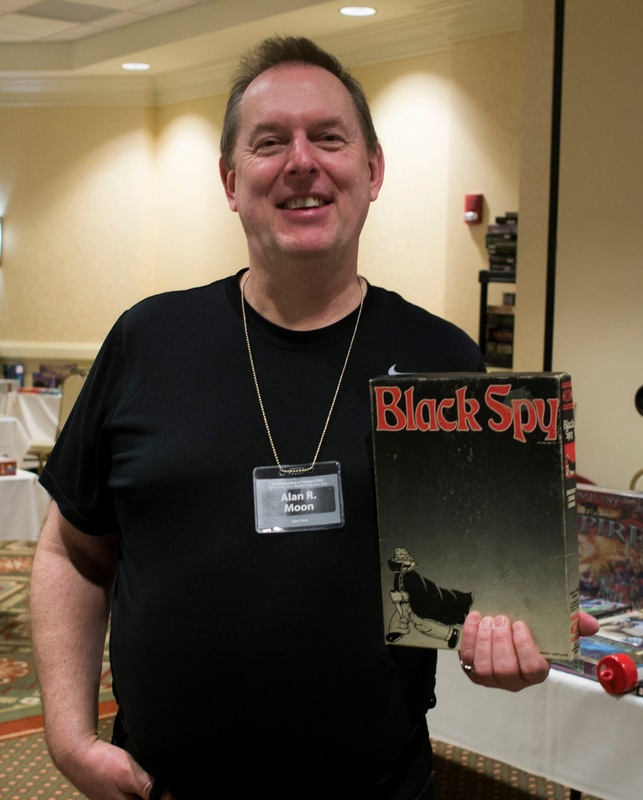 Alan Moon with an old copy of Black Spy. Since you’re making a film about game design, I have to ask: do you have any game designs of your own that you’re working on? One designer told me a fascinating story. Gamers and publishers are always looking for that new and exciting game mechanic. So instead of creating a game based on a theme, he came up with an original mechanic and simply plugged it into one of his favorite games–Ra by Reiner Knizia–which is also one of my favorite games as well. So I recently thought of a cool mechanic but I don’t have a game to go with it yet. I might try his strategy and plug it into Settlers and see what develops. Besides your Kickstarter page, is there anywhere else you’d like to direct our readers? www.tabletopmovie.com is our main site for the movie. For the duration of the campaign, it points to our Kickstarter campaign. After that, who knows. www.grandfatherfilms.com Adventures on the Tabletop is not my first rodeo. In fact, it is my seventh independent film. Trailers, clips, and information on my other films are found at my main Grandfather Films website. www.facebook.com/grandfatherfilms is a newly established page where I primarily post stills from my films. The actors and their friends really enjoy it, and the still shots are quite beautiful. I also post information relevant to the films from time to time. We also have a very new Facebook Group, Adventures on the Tabletop. Those that miss the Kickstarter campaign can get their news here. Since the movie should extend spider-web-like to many designers, there will be a lot of additional content and links that make their way onto the Facebook page that will be very different than the backer updates on Kickstarter. Thanks to Doug Morse for taking the time to answer our questions. If you’re interested in Adventures on the Tabletop, consider backing it now on Kickstarter. After the Kickstarter campaign, the DVD can be preordered from www.grandfatherfilms.com You may also contact Doug through the contact form on the website or on Gmail as moviemaker.